Tomorrow marks an important day in the fight for justice for the victims of Srebrenica and other atrocities committed during the Bosnian war, with the verdict in the trial of Radovan Karadžić due to be handed down by the Trial Chamber of the International Criminal Tribunal for the Former Yugoslavia (ICTY) . Remembering Srebrenica is calling on Britain’s young people to stand up to hatred and join with older generations to create a safer, stronger society in the 21st anniversary of the Srebrenica genocide. Al Jazeera Balkans has launched a new interactive website marking next year's 20th anniversary of the end of the siege of Sarajevo. Some 20 community activists from across England travelled to Bosnia & Herzegovina in December 2015 on our 'Lessons from Srebrenica' visits programme. A group of people from Manchester travelled to Bosnia & Herzegovina with our 'Lessons from Srebrenica' educational visits programme to witness at first-hand the testimony of survivors and Mothers who lost loved ones in the Srebrenica genocide. 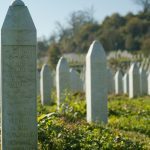 Five young people born in the year of the Srebrenica genocide take a journey into the heart of darkness in a new BBC documentary.